This horse presents a real challenge for handicappers. He's following in the shadow of a very short list of Japanese-based horses to come here for the Triple Crown - Lani last year was a pioneer. And the races he have run in, while impressive, are hard to really compare to other races and draw meaning from. And he hasn't run since the end of March, so we have a long layoff to contend with. And his trainer has never run in North America before. And his breeding, though familiar in terms of a racing past, is largely unproven over here as a bloodline. There are all sorts of questions and a shortage of answers. The horse could be special and prove to be the class of the field. Or he could be outclassed and uncomfortable because of so much unfamiliarity over here. Frankly, nothing would come as a surprise. It's horses like this that make handicapping so fun - and so frustrating. Last race: The results of some races are all but impossible to interpret, and that is the case here. Epicharis was a strong second in the UAE Derby, losing by a narrow margin. The problem, though, is what happened next. The winner of that race, Thunder Snow, took the spot in the Derby starting gate he earned by winning the UAE Derby. Soon after the gate opened, though, he started bucking. His race was over before it had really started, and he wound up watching the horses go by the second time from the sideline. So, we have no way of knowing how well Thunder Snow measured up to the Derby horses, so we can't know if losing to that horse was flattering or problematic. And he hasn't won since that race, which was on March 25, so we are really working blind here. Prior experience: Before heading to Dubai, the colt was unbeaten in four starts in his native Japan. He had been very dominant in the first three wins, coming out on top by a combined 25 lengths. The fourth race was much closer, but it was also the most important. 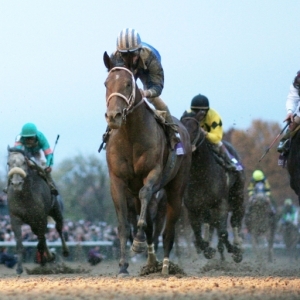 He won the Hyacinth, which for the first time was a qualifying race for the Kentucky Derby. By winning he earned a spot in that race, which he obviously chose not to take. Though we don't know a lot, it sure seems like this is a better horse than Lani was last year, and that Japanese runner ran in all three Triple Crown races and had his best showing in the Belmont. Trainer: Kiyoshi Hagiwara. I can't claim either to follow Japanese racing or to speak Japanese, so I can't pretend to know too much about Hagiwara. He'll be making his North American debut in this race, so he certainly isn't easing into things gently. He trains in a very different style than American trainers do, so it will be interesting to watch how he adjusts as he is plunged into the deep end. Jockey: Christophe Lemaire has been on the horse for all five starts and is expected to get the mount again in the Belmont, though that hasn't been confirmed officially as I write this. He is obviously French, but he has had a fascinating career. He has ridden extensively in Japan over his career, winning most of the biggest races there. He has also had strong success in his native France and in England, and he has won the biggest race held in both Hong Kong and Australia. He has not ridden much in the U.S., but he does have a Breeders' Cup race victory. It will be very interesting to see his riding compared to a pretty strong domestic group here. Breeding: Epicharis was sired by recently-deceased sire Gold Allure, who was a two-time champion sire in Japan and sired a Japanese horse of the year and several other top Japanese performers. Gold Allure was sired by Sunday Silence, the legendary winner of the Derby, Preakness and Breeders' Cup Classic in 1989. He spent his entire stallion career in Japan, where he was the country's top sire 13 times. Epicharis' damsire is Carnegie, who won the Prix de l'Arc de Triomphe as a three year old. He stood for a while in Japan but had his most success in Australia and New Zealand. If nothing else, I 'm very excited to have the Sunday Silence influence back in the Triple Crown - there were few horses I have enjoyed watching more. Odds: The oddsmakers at MyBookie are intrigued by the Japanese invader. He has been installed as the early co-second choice in the field at +380, behind only near-certain favorite Classic Empire. Given the inconsistent and often underwhelming nature of the domestic class this year, it's not surprising that they would favor an intriguing and often impressive foreign entry. He faces a lot of obstacles, though, so you need to be aware of the risk involved in betting on him at this, or any, price. Doc's Sports has a fabulous offer for new clients. Get $60 in free Belmont Stakes picks with no obligation whatsoever! All you have to do is sign up here , and you will not be required to enter credit card information and you will never have to deal with a salesman.